As I was looking for recipes for poached eggs recipes, I ran across this one, which was Jeffrey Saad’s mini-challenge on the show, The Next Food Network Star. Added a few things and substituted some ingredients and made my own little creation. One thing that made me look forward to making and eating this dish was an excuse to buy and use white truffle oil. And I have a story. When I went to HEB, I couldn’t find it on a shelf, but a kind employee said that he had just seen it the other day. After 4 minutes of standing in the aisle pretending like I was going to buy a bottle of olive oil, the employee came back with a bottle that normally would have sold for $15, but there was a big, round neon orange “discontinued item” sticker with a $1.49 on it. Sweet! Thanks HEB. Directions: Toast the baguette until medium tan. Meanwhile, sautee spinach with garlic, S&P until done. Separately, fill a medium size saute pan with cold water, add 1 teaspoon salt and vinegar and bring to a boil. Crack 1 egg into a small bowl; then slowly slip it into the simmering water. Poach the eggs for about 3 minutes, until the whites have coagulated. 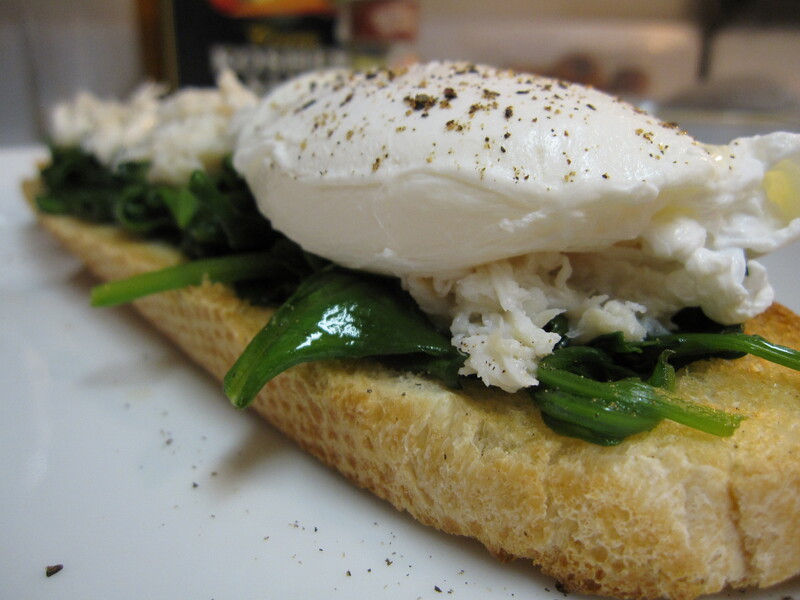 Assemble spinach on top of bread, top with lump crab meat, and poached egg. Drizzle white truffle oil over the eggs, season with S&P, and shredded parmesan.